Looking for an easy crowd-pleasing recipe? This dish, created by our Midwest Region Sales Manager Molly Sweeney, has a jambalaya feeling to it. It’s extremely forgiving and easy to add/change/improve, so don’t hesitate to use your own touches. Once prepped, everything can be cooked (in almost any order) on an outdoor grill or in a skillet. Make it ahead and serve it as an appetizer or put it over a bed of hot grains as an entree. Pair it with a crisp Rosé wine for a perfect match any time of the year. 2 lbs shrimp, peeled and deveined, tail on, sliced in half lengthwise. Large shrimp (10/15 count) work best. If you’ll be including the optional corn, Remove the outer dark green husks, leaving the light green husks in place, then soak the corn with the light green husk in cold water for 20 – 30 minutes. While the corn is soaking, make the dressing. Combine basil, mint, honey and vinegar in a jar with a tight lid. Shake until well blended. Heat half of your grill to medium hot. Place a large bowl nearby to contain the items as you cook them. Sprinkle the prepared shrimp with salt and pepper. When grill is hot, remove optional corn on the cob from its water bath and grill it on indirect heat for 25 minutes. Next, grill onions and peppers on direct heat until soft all the way through but still holding their shapes. After grilling, cut onions and peppers into bite-sized pieces and place them in the bowl. Grill shrimp on direct heat for about 1 to 2 minutes per side until no longer translucent, add to bowl with onion and peppers. Grill sausage until cooked through. Remove from grill and slice into coin-shaped pieces. Add to the bowl. Cut grilled corn off the cob. Add to the bowl. Add the olives, tomatoes and fresh herbs to the bowl. Shake the dressing again and, while shrimp and sausage are still warm, drizzle the dressing on in small amounts to taste, stirring everything to mix well. You can reserve the remaining dressing for another use. If you’re NOT using a grill and you ARE including the optional corn, preheat oven to 425 F. and ready a large bowl to contain the cooked ingredients. Roast the the water-soaked ears of corn in the oven on a baking sheet for 20 minutes or until done. While corn is roasting, dice the onions and peppers into bite-sized pieces. Add a tablespoon of olive oil to the skillet and heat it to medium hot. Add onions and peppers to the skillet and sear until golden but still able to hold their shape. They should NOT be mushy!). Remove vegetables from the skillet and place them in the bowl. Re-coat skillet in cooking spray or olive oil and add the sausages – searing on all sides until cooked through. Remove sausages from pan and slice them in coins. Add the sliced coins to the bowl with the onion and peppers. Recoat skillet with oil and heat until smoking. 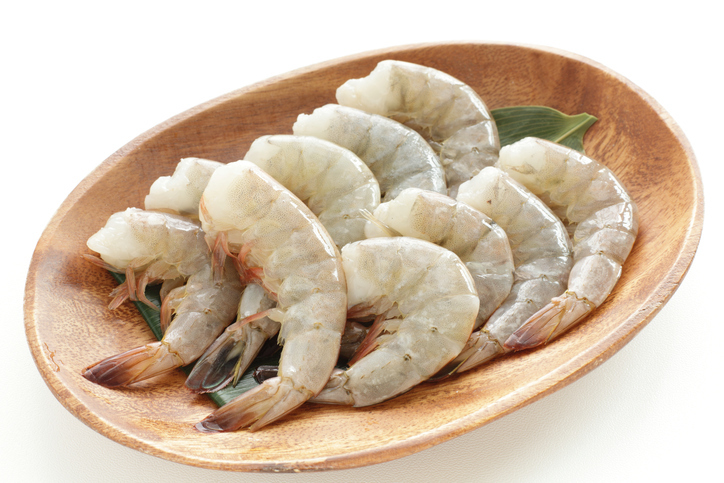 Add the prepared shrimp, one layer at a time, but do not crowd them or the shrimp will not sear. Sear the shrimp, turning once until shrimp are no longer translucent (2-3 minutes total). Shrimp may need to be seared in batches. Add the cooked shrimp to the bowl. Add olives, tomatoes and fresh herbs to the bowl. Shake the dressing jar and while shrimp and sausage are still warm, toss in dressing to taste. Reserve remaining dressing for another use. Serve the dish warm right away or make it ahead, refrigerate, and remove from refrigerator beforehand to serve at room temperature. This dish is actually better after it sits for a few hours.